JOBST compression stockings with zipper are found for the venous leg ulcer care. When there is any malfunction of the venous valve in the legs, the lower leg is vulnerable to ulcer formation. This JOBST Ulcercare compression stockings with zipper help them to care for the wound and make it easier for wearing the compression stocking. The compression stocking can reduce the venous leg ulcer and can also prevent its formation. The gentle pressure it exerts on the muscles and the veins reduces the chance of a such a problem. JOBST Ulcercare compression stockings are available with the zipper on left side or on the right side. A compression lining is also part of the care. It either comes with the stocking or sold separately. What is venous leg ulcer? The valves in the blood vessels are unidirectional. The valves in the venous area of the leg when function improper and allows the blood to flow in both directions, this creates pressure. This high blood pressure creates blood clots. These blood clots are hard on the skin tissues which wither and later form into ulcers. The venous leg ulcers are common in elderly people, although even young people can have this problem. JOBST compression stockings with zipper help by improving the blood circulation to the lower part of the legs. The Compression Stockings can reduce the venous leg ulcer and can also prevent its formation. The gentle pressure it exerts on the muscles and the veins reduces the chance of such a problem. Basically, the occurrence of venous leg ulcer is due to lack of enough blood circulation to these areas. These ulcers are usually painless but some can be painful. Compression bandaging is comfortable and a part of the treatment for venous leg ulcers. The gentle pressure exerted by the stockings can gradually counter the high pressure in the blood. This relieves pain and can prevent the ulcer formation. For a compression stocking such as the JOBST Ulcercare, the pressure is more at the ankle area than in the knees. It is called gradient compression where the pressure is different and the gradient from bottom to top. The gradient compression stocking will improve the blood circulation and also reduce the vessel diameter that helps in blood flow control. For a compression stocking for leg ulcers, the pressure is ideal around 40 mmHg. This is enough to prevent the ulcer formation for patients who are bedridden. It could also be helpful for the wound healing by improving blood circulation to the site. JOBST compression stockings with zipper are usually worn with a liner underneath. The liner helps with protecting the wound dressing and also makes it easy to put on the compression stocking. The JOBST compression stockings with zipper are the easiest of all as the zipper opening allows more space and one can put on the stocking without hurting the wound. The stockings with zipper are meant for those with wounds. The zipper is closed after wearing the sticking with ease. The zipper is provided with a locking facility that keeps it in place. JOBST compression stockings with zipper help by improving the blood circulation to the lower part of the legs. This is effective in decreasing the inflammation and thereby in wound healing. There are 2 types of JOBST compression stockings with zipper Ulcercare available. They vary in the pressure it can exert. The difference is also seen in the style- it is either the open toe or closed toe. They are mostly knee-high in length. About: JOBST Ulcercare compression liners are the first layer of compression worn. This has only very less pressure and is easier to put on. The main purpose is to protect the wound dressing and keeping it in place. This is an important part of hosiery for patients who are incompetent to care for themselves and can also prevent the ulcer formation as they are bedridden. This is made with 79% nylon, 16% spandex, and 5% silk. All compression liners are white in color. Safety: These compression liners are safe to wear for 24 hours. There is silk lining inside to make it smoother on the skin. It is shaped anatomically to have the toes and heels falling into the groove. Compression liners are suitable to be worn by everyone. It is suitable even for normal clothing or going out. Care: JOBST Ulcercare compression liners are easily washable. Use only warm water for the washing. People with venous leg ulcers should wear this liner before they put on their compression stockings. Size: These compression liners are available in different sizes such as small, medium, large, extra large, 2XL, 3XL, and 4XL. The chosen size should be the same as the compression stocking that you are choosing. This is a pair of open toe knee high compression stockings with zipper. The stockings can be used in either leg. Just make sure that the wound and the zipper happen to be on opposite sides. This is also available for left leg or right leg as single pieces, separately. Convenience: This provides the extra firm compression when worn over the compression liner. This is convenient to be used with normal clothing. It comes in a beige color that is fine with most clothing. This is a unisex piece with no gender discrimination. Pressure: This compression stocking can provide a pressure of 30-40 mmHg. It provides the compression in a gradient manner with more pressure at the ankles than in knees. It fits well when chosen in the right size. Size: There are 3 different sizes available for this compression stocking with zipper. The sizes are small, medium, and large. For each size, there are 2 variants depending on the calf circumference. The length is either under 16 inches or over. Others: The JOBST Variox compression stocking with zipper is made of 77% nylon and 23% Spandex. It is machine washable only in lukewarm water. Hand washing is preferred for its durability. It is better to dip dry and if you must use a machine set it at low heat tumble dry. This JOBST Variox compression stocking with the zipper of its particular pressure range is useful for chronic venous insufficiency, severe varicose issues that trouble during pregnancy, deep vein thrombosis, post-thrombotic syndrome, severe edema, or varicose veins etc. This is a package of compression stocking and liner. This pack is especially for those with wounds. The liner keeps the wound and its dressing in its place without interfering. The stocking goes over this liner to provide the needed pressure. 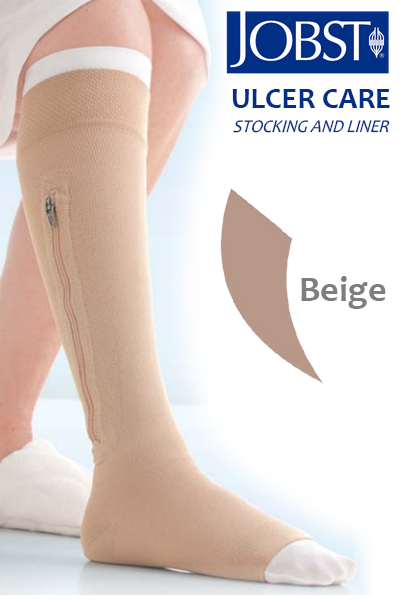 This Ulcercare comes in beige color only and the lining is white. This is a 2-in-1 compression set. The pack contains one compression stocking and 2 white liners. The pressure here is nominal 40 mmHg. This is suitable for the normal life and can wear normal shoes as well. The stockings are convenient for easy wearing or for the caregiver to put on for the patient. It comes in 7 sizes. This gradient compression stocking helps relieve the pressure, reduce inflammation, and improve the blood circulation. The JOBST Ulcercare compression stocking with zipper is available with the zipper on the left side or on the right side as needed. This facility is available in all the 7 available sizes of small, medium, large, XL, 2Xl, 3XL and 4XL. The product is machine washable in warm to cold water and suitable for tumble dry at low setting. We just saw that the Jobst compression stockings providing relief for the venous ulcers. Now here is the Jobst medical leg wear 20-30 mmHg that is also for the lower leg ailments. The lower leg ailments such as edema, varicose vein issues that come with pregnancy, orthostatic hypotension etc are all relieved with the help of the Jobst compression stockings with the pressure of 20-30 mmHg. The pressure range here is more than moderate at a firm compression stage and also the second highest pressure for the compression stockings leg wear. The Jobst medical leg wear 20-30 mmHg is useful for the moderate to severe stage of the following discomforts of the lower leg area. Relives moderate to severe case of varicose vein that comes during pregnancy. The pregnancy varicose vein has different stages. It is needless to say that the moderate to severe cases are too hard to handle. These medical leg wear with a compression of 20-30 mmHg from Jobst will help in relieving the pain and also in preventing the occurrence as well. It is helpful for the post-surgical prevention of varicose veins and the appearance of spider veins. It also works in similar manner to prevent these symptoms, post-sclerotherapy. For the management of ulcers and other manifestations as part of post thrombotic syndrome. It is used for the treatment of moderate to severe edema and that of lymphatic edema. It relieves superficial thrombophlebitis or the blood clot that is caused by vein inflammation. Prevents orthostatic hypotension – the reduction in the blood pressure because of long term standing on the legs. It also prevents the deep vein thrombosis which is otherwise called economy class syndrome. The different types of Jobst medical leg wear 20-30 mmHg is differentiated depending on the length, gender and the activity level. You can find the compression stockings in all of these varieties. Length: Depending on the length of the compression stockings, you can find the knee high or thigh high. They could be either opened toe or closed to make a complete sock. Gender: There is no much gender differentiation for this Jobst medical leg wear 20-30 mmHg compression stockings. Majority of them are unisex stockings. But there are a few options for men’s casual wear and that for women, in the form of opaque colored stocking. Activity level: Not all compression stockings can be used for active sports or activity level. That is why there is this active wear Jobst medical leg wear 20-30 mmHg. The Knee high closed toe stockings are similar to that of the ordinary hosiery. Here it has gradient compression ad well supported at the knees. The fabric is soft and smooth. The toe area is generous for anyone to fit and there is also the heel area for comfort wearing. The knee band can be silicone or not. There are 6 different sizes like small, medium, large, large full calf, extra large, extra large full calf. The only difference for the open toe variety is that the toe area is open. It is also available in black and beige color, while the closed toe is available only in beige color. There is also a type for the knee high stockings for the petite body type. Thigh high socks are also with gradient compression and with enough space for the toe area with a reinforced heel area for its durability. These stockings are either closed toe or open toe. The open toe variety has a band protecting at both the ends. They are all available in small, medium, large, and extra large sizes. All the knee high and thigh high Jobst medical leg wear 20-30 mmHg are unisex stockings. There is this men’s casual stocking that comes in knee high open or closed toe. The men’s wear is contemporary that is everyday wear. It is comfortable for the whole day that also has wicking technology to take the moisture. The opaque stocking is for women. It is soft, comfortable, moisture wicking, easy to wear. It can hide any blemishes on the legs and lasts longer than others. These thigh high stockings are available in different sizes also. The sportswear is cushioned with better moisture management. This is soft and suits for an active life. This is better for the weekend activity. It is knee high with a secured band at the knees. It is available in white or black colors. The size availability is from small, medium, large, large full calf, extra large and extra large full calf. The size differs with the circumference of the ankle and knee. The ankle measurement ranges from 7-15 inches and that for the knee would be 11-23 inches. One needs to measure both the ankle and knee before deciding on the proper size. All the Ulcercare products, the liners, and the outer stockings are moisture absorbing. It does not make the skin feel hot. It is breathable material and can wick the moisture away from the skin to keep it dry. The zipper that is attached on the stocking does not go all the way up to open up the stocking. Instead, it comes in the middle part to ease the donning. What you need to note and remember is that these JOBST compression stockings with the zipper should be worn only with the advice of the physician. They can also lead you to find the right pressure for the stocking. There are not many manufacturers that make compression stockings with zipper. People with a wound on legs or have the leg ulcers can sure benefit with these easy to wear stockings. The JOBST compression stocking with zipper seems to be good quality medical stockings. At Jobst you get the compression stockings with zipper and also the next lower level compression leg wear with a pressure of 20-30 mmHg. Once you have the ulcer under control and just want to maintain the better health, just follow it with the lower compression level. The only problem is that there are not many real customer reviews that let you know how it really feels. There are reviews, but that may not be enough for many. The good quality making makes this an ideal choice but the price can be higher for such convenience.